Abbey Rise is small Victorian townhouse on the southern banks of the River Avon. 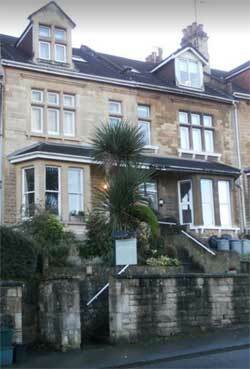 Located in Bath City Centre close to the Jane Austen Centre museum and the Prior Park Landscape Gardendscape Garden. The owner's experience as housekeeper to the Queen ensures a right Royal welcome to guests from all corners of the globe. It's a relatively small and cosy affair and although fairly modest in terms of facilities each of the three guest rooms are decorated to a very high standard and are supported by a range of luxury items including Egyptian cotton sheets, white fluffy towels, luxury toiletries and small library of DVDs. The hospitality tray is also stacked with no shortage of goodies. Each of the rooms features an en suite bathroom (with shower) tiled and designed with class and comfort in mind. This pleasing bed and breakfast is located just several minutes walk from the Train and Bus stations, and all the major attractions in Bath city centre including the Roman Baths, Abbey, Royal Crescent and Circus. Private off-road parking and first-class breakfasts make this a charming home from home. Easy access to Prior landscaped Garden to the south of the property.